Ok, I know it's not Waffles Wednesday...but I have something REALLY important to share so I got special permission from the Boss to tell you about it today. I just have to be nice to her and not touch her for a whole 5 years. Or 5 minutes. I forget. 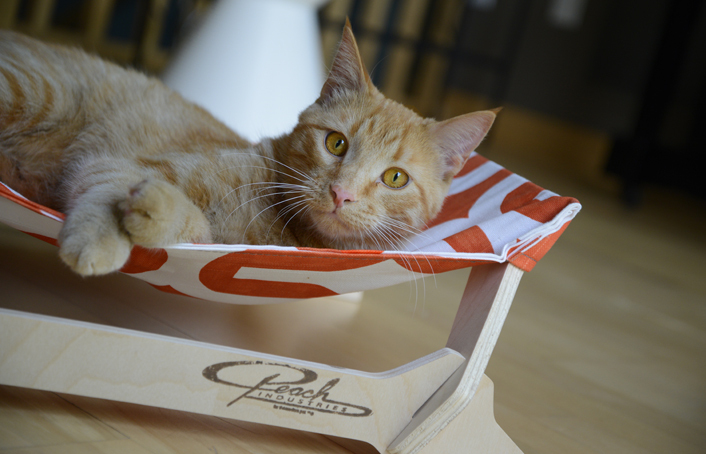 Remember that cool kitty lounger giveaway we had a couple of months ago? 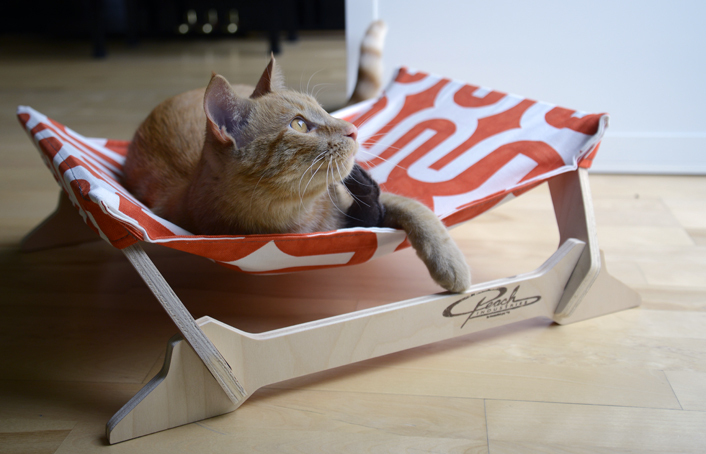 Well, the talented people at Peach Industries have designed a BRAND NEW kitty lounger. In fact, they picked this new fabric out just for ME!!! Don't you just love it??? And even better, one lucky GLOGIRLY reader is going to win one of their very own! This lounger is called the Kitty Lounger Mini. It's eco-friendly and made with all the same top-quality, USA sourced materials as their original lounger. 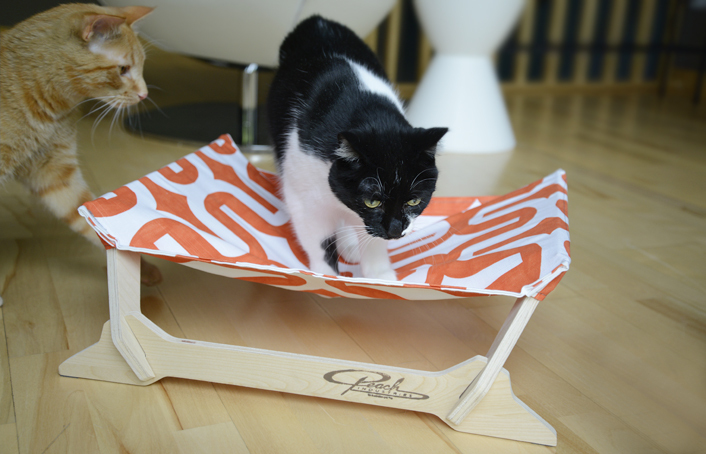 It has a sleek low-profile design that makes it ideal for cats with limited mobility. The sides are raised to make it feel extra cozy...just like a real live hammock. Ok, I don't know any real *LIVE* hammocks, but trust me when I tell you it's cool. Just like their other lounger, one of the things we love the most about it is the modern and simple design. There's no hardware, no moving parts... unless I jump on it from the other side of the room. It's just four pieces of wood and a square of fabric. The legs are slotted to fit right together. I didn't even need to read the directions. KATIE: Good thing, Waffles. Considering you don't know HOW to read. KATIE: Hey Waffles, I don't think they picked this cool fabric out just for you. Look how gorgeous it is with classic black & white. Besides, the fabric is called Marmalade. Last I heard, your name was Waffles. WAFFLES: Yeah, well maybe I wanna change my name. So there. 1. Visit the Peach Industries website and take a look at the new Kitty Lounger Minis. 2. Come back here and leave a comment telling us which fabric choice you like the best. 3. Make super-sure we have your email. 3. Share this giveaway on Facebook. 4. Follow GLOGIRLY on Pinterest. Deadline to enter is 11:59pm EST, Saturday August 24. 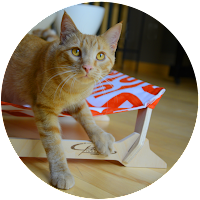 Only US & Canada readers are eligible, but if you live overseas you can gift your lounger to a friend or shelter. Winner will be drawn randomly using Random.org. Winner will be notified via email and must respond within 48 hours with name and mailing address. FTC Disclosure: We received this product for review at no charge from Peach Industries. We also received a small fee to cover the time it takes to test, take photos, and write the review. Receiving the free product and the fee did not influence our review. All reviews on GLOGIRLY will always reflect our honest and unbiased opinions. I love the Neptune fabric! I think the Marmalade would look great with a certain orange monster on it! But if Harvey isn't on it, I bet Lowenstein would like a turn on it too. We like Glogirly on FB! We like Peach Industries on FB! I just liked Peach Industries on FB. I love the Neptune design - it would look good with all my cats "design"
I follow Glogirly on Pinterest! I think the Amethyst would show off my 3 orange cats best! 1. Like GLOGIRLY on Facebook. Of *course* we like GLOGIRLY on Facebook! 2. Like Peach Industries on Facebook. Yes, we also like Peach Industries on Facebook! 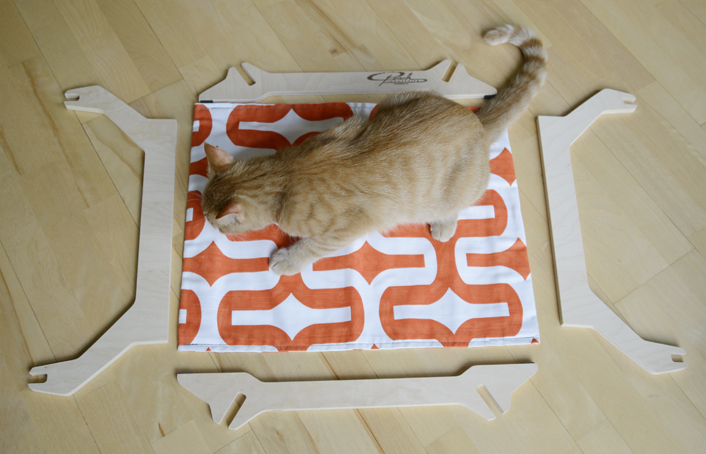 We like the marmalade fabric and Meowm likes the amethyst. We like you on FB. We like Peach Ind. on FB. We are not going to enter because we have a lounger from your last giveaway and that would not be fair but you can tell Peach Industries that Harry LOVES his lounger - when he is not fighting Sherpa for it! This is adorable. We'll pass to let someone else win. It does look good with a certain tuxie on it! We love the marmalade color. We already like Glogirly on FB. WE liked Peach Ind. on FB. We follow Glogirly on Pinterest. I would love to have a mini lounger in the Neptune fabric! Beautiful. I already Like Glogirly and Peach Industries on Facebook. ALL the fabrics are nice for different reasons: probably we would have to say the Slate is our choice because it would look the best with our furnishings. But, wow, Marmalade is really fun, Neptune too and Amethyst would be quite a statement!! I like Peach Industries on facebook. I follow Glogirly on Pinterest. We like Peach Industries on Facebook. We shared your post on Facebook. The royal purple would go best with MY fur! Although maybe I should let someone else have a chance since I already won a t-shirt for my human... which she is probably wearing to Barkworld. We love the amethyst! It's PURR-ple!!! We like the slate color best. It goes best with everybody's furs -- as if we would share. That Lounger sure looks comfy. And we are more than willing to all take turns on it. So please enter us. Oh! Oh! Oh! Us! Us! Us! We would love a lounger, cause we are good at it! We took a vote and liked the Neptune Lounger bestest. Thanks Waffles! Pee S, You can reach us at edensp1 at hotmail.com (we are sure you have it, but just in case). Mommy says the Neptune Lounger goes with our decor. She is funny like that. Waffles and limited mobility does not belong in the same post. We liked everyone on FB and shared on FB and Twitter. I bet I would look good on that lounger, too, Waffles! Oh yeah, we like you on FB. And we like Peach Industries on FB. We think we follow Glogirly on Pinterest...we'll hafta check. DOOD! Did you know my name was Marmalade in my life before I was adopted???? It's kizmet, fate, my destiny to lounge in that sweet piece of nappin' furniture! We also love Peach Industries! We loved the Amethyst Lounger! We liked Glogirly on FB. We liked Peach Industries on FB. We shared the giveaway on FB. We tweeted about the giveaway! I think amethyst will go best with a brown gray tabby. We think the amethyst would go great with our white and silver floof. We already follow Glogirly on FB. We love the Neptune fabric. It's perfect for my kitteh. That is such a nice lounger. I have a hammik....I don't use so I won't try for this pretty lounger...good luck to everyone! Though we don't have a blog, we would love the lounger ... we like either the marmalade color or the neptune. Those are pawsome. I can't believe they don't have pink! I guess I have to pick amethyst. Mom'll like that - she loves purple! The gray one wouldn't show up my fur when I leave it behind but I do like the one you have. I think I would look lovely on the red and white one. I will go to FB and like you too. You have me email address yes? Went to FB and liked you and also Peach Industries. I don't even know what Pinterest is and I don't tweet. Oh well. I love the Neptune fabric. It's perfect for my kitteh. We like slate!! - Crepes. and we shared it! - Alana & Crepes. I now like the Peach Industries FB page. I love the Neptune fabric. My e-mail is flowergoddess412@hotmail.com. I like the Neptune fabric! I already like GloGirly on facebook. Already like GLOGIRLY on Facebook. Hmmm...at 19 X 19 inches I think my dog would fit in there. If not, I can give it to my cousin's cat. We would love to win the Neptune fabric one since our livingroom colors are blue. You already have my email. Still thinking about the logo and new designs for my social media profiles. I already like Peach Industries on facebook. We like the Marmalade and Meowm likes the Amethyst. You and Peach Industries are liked on FB. I tweeted on twitter (owlandphoenix). I love the Slate one. Waffles and Marmalade.. mmmmmmm yum! 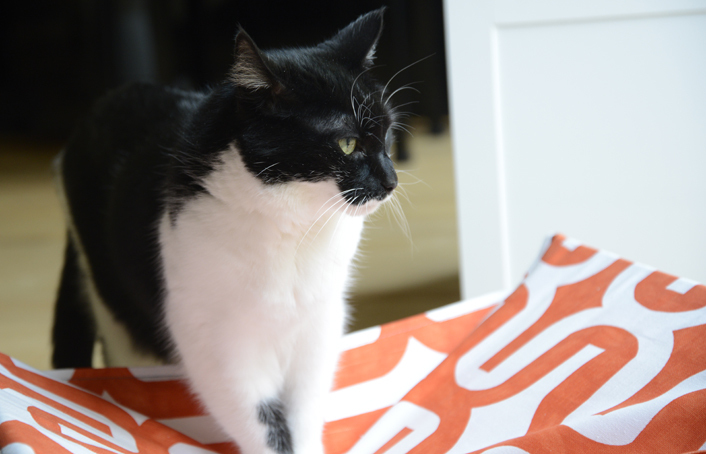 My kitties love the Marmalade fabric! These are amazing! We loved the marmalade fabric! Aww love the new designs! They are so super cute! I think the marmalade is really cute. But purple is my fave color so I do like the amethyst one too. They sure are amazing and I could snuggle up in a Neptune! we love the neptune lounger. we have already "liked" GLOGIRLY on FB. Mowzers, we think Marmalade will TOTALLY clash with Allie's pink nails, so we boyz want THAT color! Oh, and we "like" you guys on FB too! oh...AAAAND, we shared on FB too!! WOOT! We really like the marmalade design. It's bright and pretty. Oh dear, none of these go with our decor but I'll choose the Marmalade. Then again, we 200 entries, I don't stand a chance anyway. It's so hard to pick...but we'll go with the Amethyst! Thanks for the chance and God bless you. Like Glogirly on Fb (Angela T). Like Peach Industries on Fb (Angela T). Following Glogirly on Pinterest (The Queen of Spain). Oh we love the MARMALADE for Jean Pierre--our orange cat like Waffles! He's the eldest cat (12 years) and just went in for his annual vet check and he was so good. But now we have to schedule dental cleaning and he deserves a special gift for being so brave. 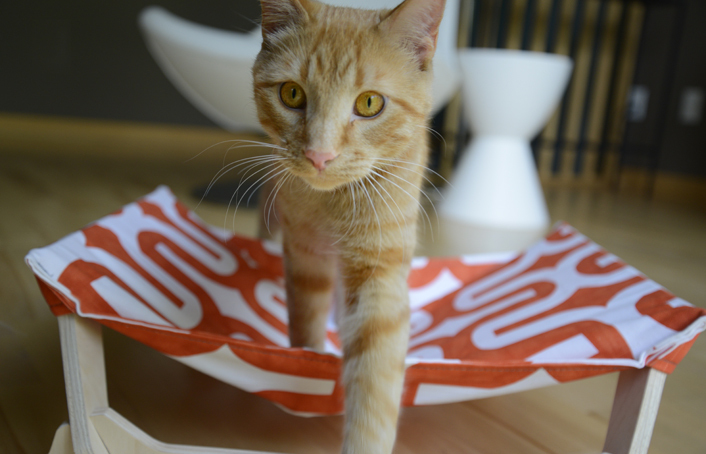 Funny thing--when we first adopted Jean Pierre, the vet said he was a "Marmalade" tabby. I swear! We already follow Glogirly, Katie & Waffles on FB! We are following Glogirly, Katie and Waffles on Pinterest! 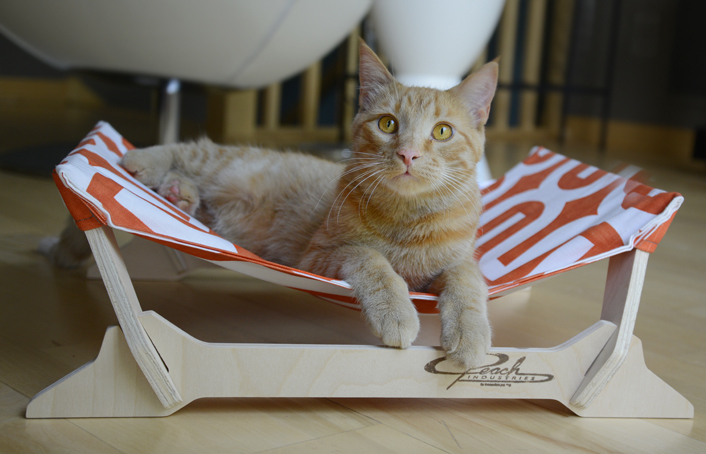 We have been following Peach Industries since you introduced the kitty hammock! Tweeted the giveaway! tweet, tweet, tweet. I like that amethyst color, but the Human says the Marmelade would look nicer with my furs and she's got the fingers so......marmelade it is. We already Liked you on FB! Well... I already have two marmalade brothers so I'll choose the SLATE fabric. I think it would show off my sparkling white and silver colours. Peepers and I have both already liked you (GLOGIRLY) on the facebook. I've already liked Peach Industries on facebook, too. Have a great time at Bark World! Tweeted about the giveaway too! I love the Amethyst Lounger! I love the marmalade lounger! I like peach industries on fb. Just "liked" you on Facebook - so sorry I haven't done that sooner!! Great posts!! Love the "Cat Art" board in Pinterest! Just followed you!! Peach Industries just added to FB Likes!! How cool - the marriage of an industrial designer with an "animal crazy" vet tech.... LOVE IT!! I really like the Marmalade Lounger that Waffles has. Thanks for the giveaway. Already like GLOGIRLY on Facebook(Sue Brandes). Already likee Peach Industries on Facebook(Sue Brandes). Following GLOGIRLY on Pinterest(Sue Brandes).